Disease Prevention and Control Centre, Latvia/ Edīte Tettere. On 29–30 May 2017, WHO/Europe conducted a technical visit to Riga, Latvia, on the prevention of noncommunicable diseases (NCDs) with a specific focus on the promotion of physical activity. 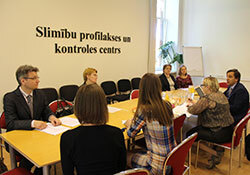 The visit also included the launch of the Latvian WHO Childhood Obesity Surveillance Initiative (COSI) report. Experts discussed the “Roadmap for Latvia: physical activity” during their meetings with stakeholders from different sectors. These included the Ministry of Education and Science, the National Centre for Education and the State Sports Medicine Centre as well as the national network of health-promoting schools, municipalities, academia and nongovernmental organizations. The physical activity roadmap will be presented to the Ministry of Health of Latvia by the end of the year. It will be based on WHO recommendations and adapted to the country context. WHO will provide further support to Latvia for its implementation. A press conference also marked the launch of the Latvian COSI report. It featured speeches by Dr Anda Čakša, Minister for Health of Latvia; Dr Iveta Pudule, Senior Public Health Analyst at the Centre for Disease Prevention and Control of Latvia and COSI coordinator in Latvia; and Dr João Breda, Head of the WHO European Office for the Prevention and Control of NCDs. In 2015, Latvia participated in the fourth round of the COSI survey. Data were collected from a nationally representative sample of 7- and 9-year-old children. The survey demonstrated the following. The prevalence of overweight and obesity has stabilized among 7-year-old children and is still high: 23.9% of boys and 19.5% of girls are overweight or obese. The difference between rural and urban areas is disappearing. The prevalence of overweight and obesity in 9-year-old children continues to grow: 29.3% of boys and 22.2% of girls are overweight or obese with higher prevalence among children living in urban areas. School (environmental) characteristics that may prevent or predetermine the development of overweight and obesity in children are generally improving, especially in schools located in urban areas. These characteristics include frequency of physical education lessons, availability of playgrounds, access to a certain food items and beverages on the school playground, and initiatives to promote healthy lifestyles. Parents tend to underestimate children’s overweight and obesity status. COSI is currently established in 39 countries and involves more than 300 000 children. This unique WHO initiative provides large data sets on trends in overweight and obesity among primary school children aged 6–9 years. It enhances understanding of the epidemic’s progress in this population group, allows for intercountry comparisons within the WHO European Region and informs action to reverse the trend. The first data collection took place during the 2007–2008 school year; the fourth took place during the 2015–2016 school year. The visit was conducted within the framework of the biennial collaborative agreement between the Ministry of Health of Latvia and WHO/Europe for 2016–2017. It was jointly organized by the Centre for Disease Prevention and Control of Latvia, the Latvian Ministry of Health and the WHO Country Office.